What can we learn from Fuller's color magic? Physicality is a limitation only if we allow it to be. 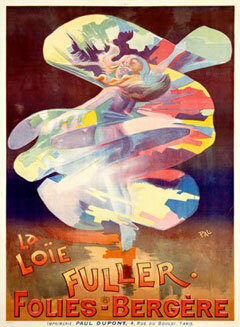 Fuller used her earth-mother physique to communicate a sylph-like spirit of the air. Her secrets? Natural, freeform movement and the power of intention. Personal history is a limitation only if we allow it to be. One is only as interesting as one makes oneself, so Fuller invented her own legend. Her secret? Reframing the truth to reveal the fascination. Formal training is less important than resourcefulness and ingenuity. Fuller's secrets? Banishing doubts and asking "What if?" A single silk and a beam of light can unfold a miracle. Fuller created something from nothing. Her secrets? Focusing on simplicity and following her inner guidance. 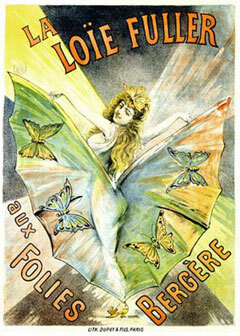 Before succumbing to breast cancer in 1928, Fuller found herself immortalized on canvas by Toulouse-Lautrec, in verse by Yeats, and on film by Lumiére. Not bad for a girl from a Chicago suburb who marched to her own drummer and followed her own spotlight. Cover by Toulouse Lautrec, courtesy Wikimedia Commons.